I don’t know what the hell is wrong with ground chicken but it’s not normal. You know that rumor that a certain fast food chain’s chicken nuggets are made out of pink goop? It’s not goop, that’s fricken ground chicken! I tried to make these chicken meatballs stuffed with goat cheese. Key word: “tried”. I used ground up rolled oats in place of breadcrumbs and added 1/8 cup of almond milk instead of 1/4 cup of regular, but otherwise followed the recipe to a T. The mixture was very wet and sticky and I knew there was no way of forming little balls out of this goop! I ground up extra oats to, hopefully, dry the mixture out a bit, but it still wasn’t forming balls. I dumped all the oats in my cupboard into the blender and ground them up but still ended up with a giant bowl of pink goop that would not form. Ready to give up and order a pizza, my chef husband jumps in to save the day. He threw the large glob in a large skillet and scramble fried it until it resembled crumbled sausage. In olive oil, sauté one medium, diced white onion and two minced cloves of garlic in a large pot on medium for 3 minutes. Add one diced red pepper and continue to sauté until softened. Add a 28oz can of crushed tomatoes, 1 tbsp Italian seasoning, one bay leaf, pinch of salt and a pinch of pepper and simmer for half an hour. I asked my Facebook friends for help picking a delicious alternative to white pasta and, thankfully, my good friends Jax and Brooke pointed me in the direction of brown rice pasta. 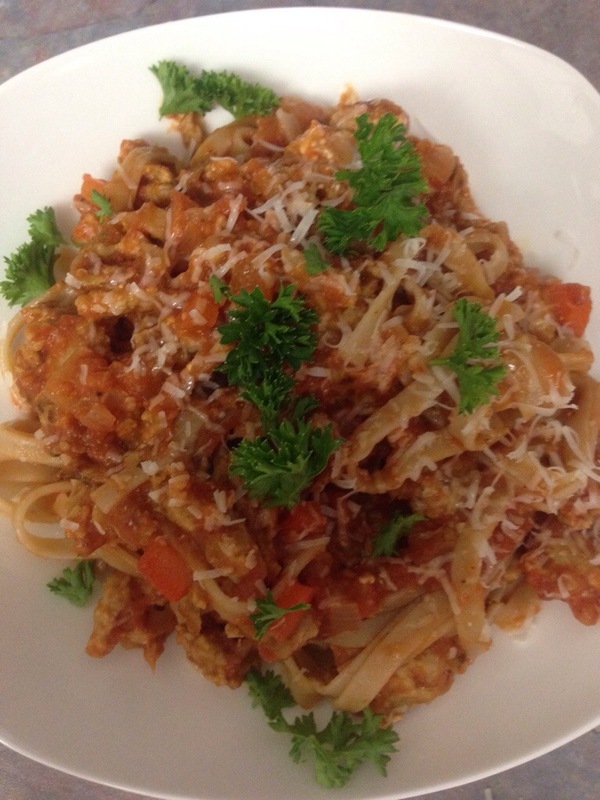 I tossed the brown rice linguini with the chicken, the sauce, and the goat cheese, topped with fresh parsley and grated Grana Padano. It was fantastic! Thank you Jax and Brooke! The brown rice pasta tastes like the white wheat pasta! And if you use the gluten free rolled oats instead of breadcrumbs you have yourself a delicious gluten free meal. You can feel good about going in for seconds of this clean eating pasta dish. Do you have a favourite gluten free, go to? Leave me a comment! Don’t let the name fool you these are very clean eating. My maid of honor made these for me for my bridal shower over two years ago and, today, I stumbled upon the recipe she left for me. I twerked her recipe in order to qualify this one as clean. Hope you enjoy! Melt 3/4 cup dark chocolate chips and 1/2 tbsp coconut oil in a double boiler. Don’t get fancy here, just boil an inch or two of water in a large sauce pan and put a stainless steel bowl on top. 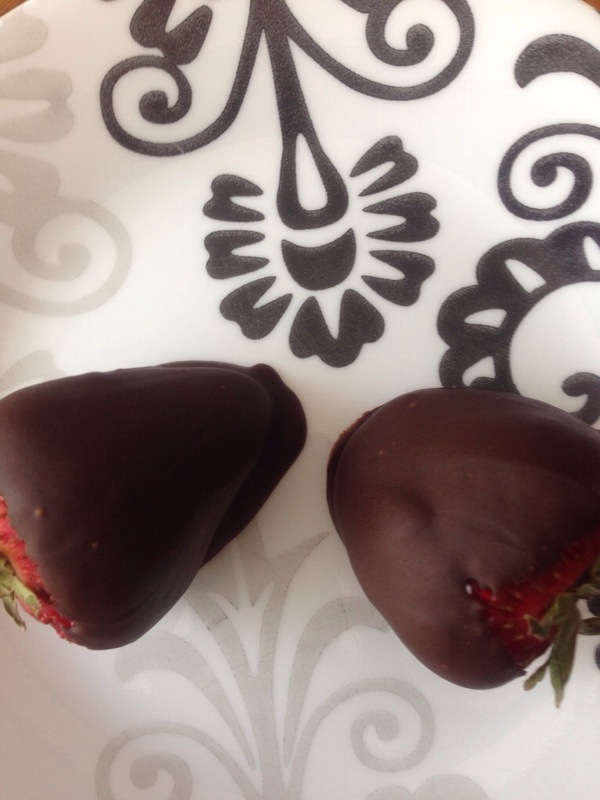 Dip large strawberries in the melted chocolate mixture and place on a wax paper lined plate or baking sheet. Refrigerate for at least an hour to set the chocolate. Makes about 10. I had some chocolate left over so I threw in some blueberries, tossed to coat and put in the fridge along side the strawberries. I can’t wait to dive in. Sometimes I feel like I’m in the Chopped kitchen or on Master Chef when I’m going through my fridge and cupboards looking for something to make for dinner. If you’ve never seen the shows, contestants get these mystery baskets with five or so ingredients that you wouldn’t think go together and they have to come up with dishes for the judges. Tonight was one of those nights. I had no meats thawed, hardly any produce and no clue as to what to make for dinner. I was on Instagram, scrolling through my home page, and I saw a recipe from @SkinnyKitchen that made me look twice: a chickpea avocado bowl. In a medium sauce pan, combine brown rice, 1.5 cups of water, 1 tsp of butter and 1/4 tsp salt. Bring to a boil, reduce heat to med-low and cover and simmer for 20 minutes. Let stand for 5 minutes until water is all absorbed. Fluff with a fork. Meanwhile, bring quinoa and 1.5 cups of water to a boil. Reduce heat to med-low and simmer, uncovered, for 12 minutes. Let stand for 5 minutes and fluff with a fork. While the grains are cooking heat 1 tsp of olive oil in a skillet. Add diced onions and sauté for about 3 minutes. Add chickpeas and tomatoes and all of the seasonings. Sauté for about 5 minutes then add the spinach and feta. Continue to cook until spinach has wilted. In each serving bowl, layer quinoa, brown rice then one tbsp of hummus. 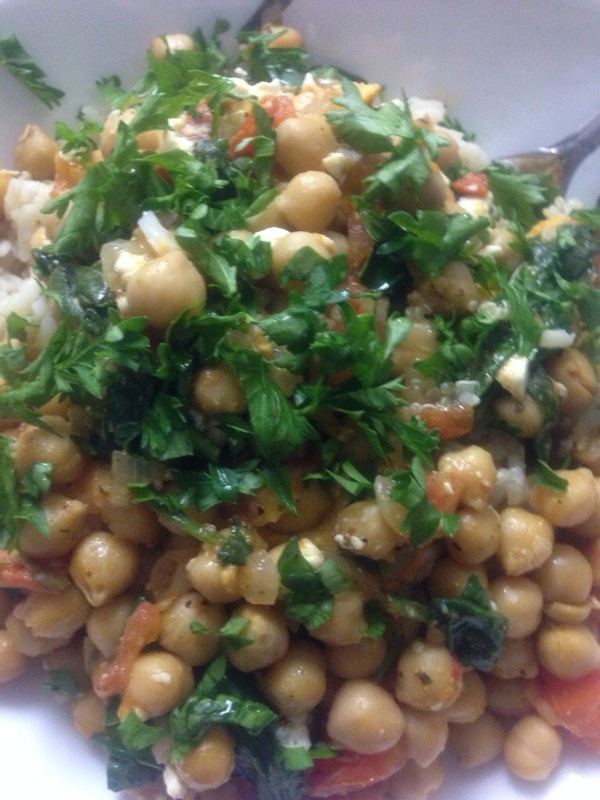 Top with the chickpea mixture, fresh parsley, and a squeeze of lemon. That’s it that’s all! Hope you enjoy. We all know that sometimes eating clean can be expensive. I’ve scoured over pages and pages of flyers from different grocery stores looking for the best deals and I’ve searched endlessly for coupons on the internet. But I’ve noticed a sad trend: there are rarely coupons for fresh produce and fresh, wholesome foods altogether. Sure there are plenty of coupons for prepackaged, crap filled, frozen section, but what about the grass fed, hormone free chickens and beef? Why should we have to pay more to be healthy? Last I checked all those hormones and steroids cost a lot more than grass that was already growing. Well I found some help. 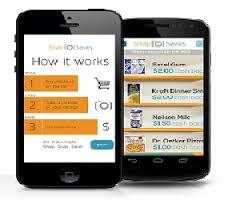 This app called Snap Saves. You can use it for android or iPhone. It’s so simple. Just take a picture of your receipt and chose the offers you qualified for. There’s always tons of savings for produce. Usually $0.25-$1 for fresh produce, up to $10 for some items libel vitamins. Once you get to $20 you can request a cheque! It might not be much but every penny counts! Plus they always have a chance to win $100 by uploading a $40 receipt. And it’s not just for food either: right now there is air fresheners, Aveeno products, Lysol cleaning products and even wine! This also allows us to be “extreme couponers” in a way in Canada since you can get the deal in the store and then go home and get more money back from your purchases. I’ve got $7.25 in my account but I buy a lot of my produce at farmer’s markets (no receipts) so it’s kind of low. You can sign up for this app (which is free) by clicking here. I wouldn’t promote it if I didn’t use it and like it. I really do use it every time I shop at a brick and mortar. It doesn’t cost you anything, I promise, and I’ve seen people actually get checks! I can’t wait for my first one! I haven’t been around much these last couple days and for that, I apologize. I have been working hard to try and take this blog to the next level, to revamp it so as to make it more interesting to read. Then, I got so caught up in trying to make some extra cash out of the deal, I lost sight of why I actually do it in the first place: because I love it. I love just writing my thoughts and feelings down. I love sharing with all of you my day to day life and I love that you love reading about it. Then one thing after another happened to us and it seemed like the universe was working against us. First, our dishwasher went on us, then my husband broke his cell phone, then the car was acting funny, then the truck died, the next day the car died, then a couple hours later my work laptop crashed. It is taking every effort I’ve got to stay positive and look on the brighter side of things. It would be all too easy to bury my head in a large carton of double chocolate fudge ice cream, but I settled for a beer and a slice of lemon cake with raspberries. Only one slice. It’s my cheat of the week. Anyways, I promise to get back on track and keep on writing daily, or every other day maybe. I will continue my quest to rid my fridge and pantry of the processed and the refined, of the artificial and the chemical. I vow to continue to provide healthy alternatives to old habits and hopefully will pick up a good workout routine as well. P.S. If you have a special way you use to stay positive in troubled times let me know by leaving a comment. He really drives home how important it is for our health and well being to eat clean and how important it is to teach our children about how to prepare and eat real, wholesome food, which was one of the main reasons I started this whole clean eating experiment. I hope that, through my own actions, I can teach my young son the importance of cooking at home and eating right. I am not saying that my child will never set foot in a McDonald’s or taste the sweet amazingness of Ben & Jerry’s (which is still on sale, by the way). But I hope he will develop a mature palate and a love of all foods whole. Baby fat, after all, is only cute on babies!